I’ve just had an epiphany. Well, maybe calling it an epiphany is a slight exaggeration, but I’ve definitely realised something about the subjective nature of taste. Anyway, the other night I opened the two back–to-back, and I finally get it. We started with the HopHog. It is a well-hopped beer, with real citrus punch and a piney resinous backbone – there’s plenty of hop-flavour and real bitterness there too, but it’s controlled. The beer sits nicely in your mouth, and doesn’t demand your undivided attention. 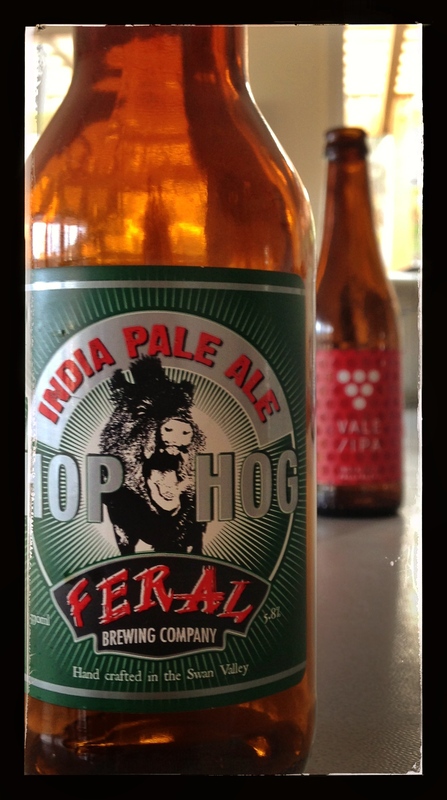 Drinking HopHog is a very pleasant experience – no one component is overpowering. Moving on to the Vale IPA, I noticed a distracting base flavour that I hadn’t appreciated before. The aromatic hop flavours were there, the alpha-acid bitterness too, and a hunk of malt. But they didn’t seem to fit together. I’d never noticed it before, but it just seemed a bit two-dimensional, jarring even. Not bad, mind; just unbalanced. So, I’ve had my mind expanded. Just a little bit. I’ve seen that my opinion of one beer can be affected by the previous or next one. And that as my palate matures, and my knowledge grows, I am starting to recognise more complex (and amorphous) qualities like balance. I’ve also learnt that when I’m underwhelmed by a beer that everyone else raves about (or at least, all those beergeeks who I respect), I should probably try it again.